Andrew Garfield looks like that little brother of your friend who just grew a foot and got hot, but at the same time he has a European male model look about him and then again something about him has Hollywood written all over. Andrew is also ticking multiple boxes in terms of his career. He is phenomenal in the chilling British film Never Let Me Go, is sole shining light in the extraordinarily overated The Social Network and has just finished playing the title character in the latest Spider-Man. Talk about it boy! 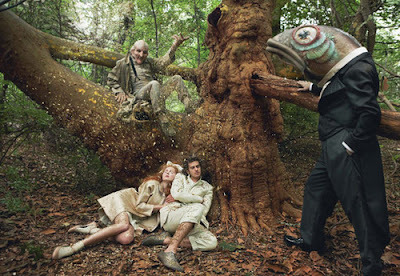 Here is Andrew with model Lily Cole in a cute shoot they did with Annie Leibowitz for Vogue in 2009 reinacting ye olde Hansel and Gretel story. 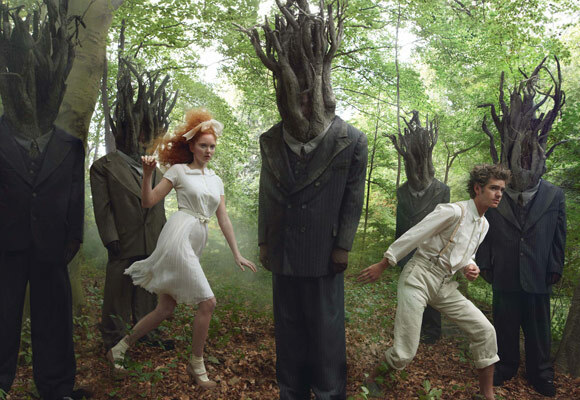 And who better to play the witch than Lady Gaga? Andrew and Lily quiz each other rather entertainingly in a Dazed Digitial interview here.